“Yeah, right,” I can somehow see you all sneering right about now: “What the hell good has ever come out of Canada?! !” Well, besides the (very early) Guess Who, “SCTV,” and of course Young Neil, there roams to this day across the Great White Northlands a man, a myth – dare I say, a LEGEND who has cast a long, black, yet somehow barely perceptible shadow over every guitar lasher who means a half hoot on either side of the dreaded U.S. / Canada border. A man who possesses a wicked tongue, beaver-sharp mind, commanding right leg and, above all, a wit and wisdom before which few others dare even stand, let alone deserve to approach. OK, look: He’s written over 300 songs, his FORTY original (Canadian) albums have sold over three million copies, and his autobiographies soared high up the (Canadian) best sellers lists. He has been the subject of at least one Masters thesis, been awarded an honorary Doctorate of Laws degree, received a citation from Queen Elizabeth as well as the prestigious Order of Canada …why, he even got married live on (Canadian) national television! But yes, despite having recently invaded the set of Conan O’Brien’s recent Toronto tapings, chances are you most likely have never heard of, much less even heard, Stompin’ Tom Connors. Probably because the man has not once performed outside of Canada -- and has never had a single record released outside of Canada -- throughout his tempestuous forty-some-odd-year career. Most ironically, this fervent, stubborn nationalism doesn’t help Connors’ own career up there one iota it seems, as he inexplicably has yet to place a solitary song on a Canadian country music chart (“They told me in 1964 I didn’t fit the format. They told me that in 1974. In 1984, they told me that again,” Tom says. “I guess the format hasn’t changed that much”). That Stompin’ Tom has not only survived, but actually THRIVED under such adverse conditions is a testament not only to the man’s rig-load of talent, but his self-described, never-fail “to-it-and-at-it-iveness”. Born unto an unwed teen, raised in an orphanage, he began conjuring songs at eleven and spent his Wonder years on the run -- and on the high seas (illegally working as an under-age merchant seaman). Once back on dry land, he indulged his Woody Guthrie fantasies and hitch-hiked the length and breadth of Canada, guitar in hand, til in 1964 he surfaced at the mangy old Maple Leaf Hotel in Timmins, Ontario …a nickel short of a forty-cent beer. Agreeing to sing for his alleged supper, Connors ended up on stage at the Maple Leaf for the next fourteen months straight (where a bartender nicknamed him “Stompin’ Tom” after his habit of keeping time pounding one gigantic booted leg against the nearest floor). He cut his first self-manufactured single the following year, signed to the tiny Dominion label in 1969, formed his own label, Boot, two years after that, starred in a cool low-budget movie and (Canadian) television series, and duly won a heap of Juno (Canadian Grammy) awards …every one of which he eventually, defiantly returned in protest of those damned, ingrateful, good-for-nothin’ “border jumpers” (Canadian talent who forsake their homeland in favor of big American record deals and low-price BBQ). You see, Tom absolutely despises all those Canucks who head south with their songs and their stompin’ boards, only to end up marrying biologically accommodating young girls from Queens: In fact, in the late Seventies he actually went on “strike” against the Canadian recording industry for not only allowing, but actually encouraging such unpatriotic practices, and so ornery was Tom over this sticky matter that his planned one-year “retirement” ended up lasting TEN. 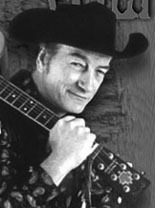 Anyways, it was between ‘68 and ’73 that the man released six albums which are today rightly considered the Holy Grail of Canadian Country: ON TRAGEDY TRAIL, BUD THE SPUD, STOMPIN’ TOM CONNORS MEETS BIG JOE MUFFERAW, MY STOMPIN’ GROUNDS, STOMPIN’ TOM AND THE HOCKEY SONG and the landmark TO IT AND AT IT. Rich in character studies as vivid as those of Hank Williams’, but etched as always with Connors’ fierce sense of Canadiana, the classic tone poems which fill these records stand today as nothing less than national totems, part of the Canadian cultural lexicon …yet still perversely receive not a speck of airplay in BTO Land. He finally ended his border-jump-protesting exile in 1989 (singing a tribute to his most high-profile prodigy, “Lady k.d. lang,” by way of reintroduction), and Connors to this day continues touring and recording proud and unbowed, remains fiercely, stubbornly loyal to his beliefs and ideals …and STILL hasn’t had an album released outside of Canada. This should not for one second deter you, however, from seeking out any of his two dozen releases newly available on shiny disc from Capitol/EMI Canada, and all produced by - who else? - Stompin’ Tom Himself. To track these gems down, simply head straight on over to www.stompintom.com Then prepare to have each and every one of your preconceived notions about All Things Twang simply dissolve forever before your very ears: NOBODY who falls under the spell of Tom ever comes out the other end quite the same way again.